Radeon Profile Tool, or RadeonPro for short, is a free, user friendly utility designed to unleash the power of AMD™ Radeon™ video graphics cards. RadeonPro applies user defined profiles upon game start, just define once the desired 3D settings for each game and have all those settings applied every time you play, automatically! Featuring basic 3D controls found on Catalyst Control Center plus exclusive controls like advanced V-Sync control and post-processing based anti-aliasing like SMAA, RadeonPro can help on fine tuning of your games making them look better and also feel better and smoother through the use of Dynamic V-sync Control (DVC) and Dynamic Frame rate Control (DFC). RadeonPro can also help Crossfire users to force multi-GPU utilization in games not supported by the driver, improving your games performance with a few clicks. Other exclusive RadeonPro Features include support for OSD functions making possible to monitor your system with GPU information displayed right on your screen while you’re gaming. You can also take screenshots or record Movies of your games with the press of a key to register your gaming moments, benchmark your games, apply post processing effects like SMAA, FXAA, Ambient Occlusion and SweetFX with full support for 64-bit games. All in one free tool! Sounds good? Download RadeonPro now and take your games to the next level! New achievement unlocked: 1 million downloads! AMD Catalyst™ 13.10 Beta 2 ready for Battlefield 4 Beta! 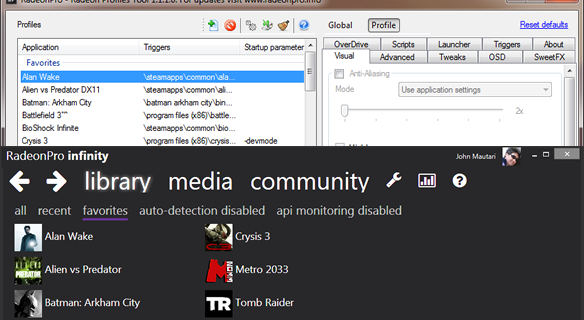 This web site is not affiliated and/or supported by AMD/ATI Technologies. 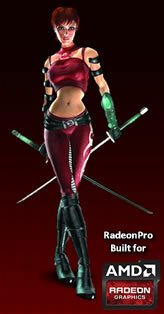 AMD, ATI, the ATI logo, Radeon and agent Ruby are trademarks and properties of Advanced Micro Devices, Inc.